Gage Lowell, twin brother of Griffin Lowell (Beach House No. 9), may not have been a combatant, but the photojournalist is among the war-wounded nonetheless. He returns to Beach House No. 9, the setting of the idyllic summers of his childhood that he shared with his siblings and friends in Crescent Cove, California. Gage plans to recharge and spend time with family and friends before he departs for another assignment in one of the world’s danger zones. He’s especially looking forward to seeing Skye Alexander, whose letters have been a lifeline for him during the most difficult days of his life, a two-week period when Griffin’s twin meter was sending danger signals and none of his family and friends were in touch with him. But Gage avoids their questions about that time and tries not to think of his reluctance to use his camera. He’s also not happy about the new awareness Skye has awakened in him. His feelings for her are putting a serious dent in the recreation he has been anticipating accompanying his rest. Skye Alexander’s parents and sister may have moved on to new places, but Skye finds great satisfaction in managing the Crescent Cove beach houses her family owns. This summer is particularly important to her since it may be her last in the setting which has been home to her for most of her life. An experience she can’t bring herself to talk about even to her closest friends has left her wary of men and panicking at strange noises. The summer crowds give her a certain sense of safety, but the thought of staying at the beach once the season ends and she is isolated again has her thinking that the Alexanders may need to sell the property. Her old friend Gage is awakening feelings she thought she’d never know again, but however strong her desire for him and her trust in him, she knows Gage will be off on his travels in a few weeks. Handing him her heart would be a foolish act. 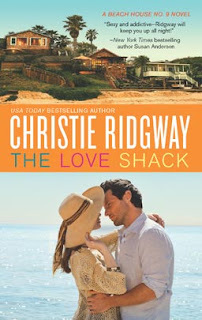 The Love Shack concludes Ridgway’s Beach House trilogy, following Beach House No. 9 and Bungalow Nights. Skye and Gage were introduced in the first book, and their correspondence has been a running thread through the series, as has Skye’s sudden affinity for clothes that hide her body. Readers who enjoyed the first two books will be delighted to see the relationship develop and to have their questions about Skye and Gage’s secrets answered. There are no big surprises here, but Ridgway continues to give her readers a combination of tenderness and steam, and those who like friends-to-lovers stories get a double serving in this novel. Skye and Gage have a long history together dating back to those childhood summers. There’s even a reference to a painting by Skye’s mother that shows the two playing on the beach as children. The letters they exchanged that helped Gage stay sane when he was caught in a situation that posed physical and psychological dangers and helped Skye maintain connection when her fears were pushing her to disconnect add another dimension to their relationship. The secondary romance between Teague White, the gorgeous firefighter who was another of their happy childhood crew, and Skye’s friend kindergarten teacher Polly Weber is another friends-to-lovers romance with Teague awakening slowly to the charms of his good buddy who has been hiding her feelings for him for years. The resolution of one thread seems rather abrupt, but the magic of Beach House No. 9 is still alive and even more potent in this final book. I thought the epilogue was a delight. Readers who have not read the earlier books may miss some nuances, but they should be able to follow the central and secondary plots with no difficulty. 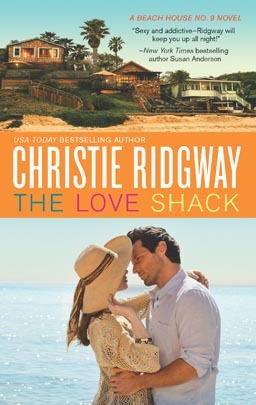 Ridgway has a knack for creating likeable communities of characters and for combining sweetness and sizzle. In that regard, The Love Shack is vintage Ridgway. I loved the first book and looking forward to meeting Gage. Jane, I liked all three books. The leads were all likeable, but I think the secondary romances were among the most interesting I've read. I have the first 2 in this series and am so happy you highlight so many contemporary books. I love your blog. I bought all 3 books & plan to read them in order. I loved the Three Kisses books that Christie had out a couple of years ago, so I know I will love these. Thanks for the review. I read the very first book and have the 2nd in my TBR pile. This one looks great also. Definitely adding to my must read/buy list.